I agree with your comments. I go to their site and sometimes they say things that are offensive to Catholic Church. I attend FFSP Tridentine mass and I wish there was a forum for Traditional Catholics of this society. If you know of any I would appreciate you commenting. Keep up the good fight and God Bless you. Well and truly stated- both parts; Tradition is MUCH broader than SSPX- and for the good of the Church it must be so; and the definition of Traditionalist is a good reference point- one of the better ones I have seen. One thing it need not be- constant carping about the "Church of Rome" -as if it were somehow distinct form the CHurch?. Excellent post, and well argued. This is one of this distinctions that not enough people can make, though I can understand why they're blind to it for those exposed to some of the more serious outrages in the Church today. But I would summarize your argument with an even more devastating argument: let's say a fresh new break-away trad group (with their own bishop) formed today, claiming virtually everything the SSPX claims except the authority of Bishop Fellay. There would be no *principled* way to distinguish this 'true church' from the 'true church' of the SSPX. Or what if the SSPX split up, leaving half of them claiming to follow the true motives of Bishop Levebvre? Who would be the 'true SSPX' in that situation? Such a situation could very well happen if Fellay has the SSPX 'return' to Rome. Simply speaking, there is such thing as an 'obedience' component to our Catholic Faith, particularly for Traditionalism; anything short of that is Protestantism. While obedience does not totally overlap with dogma, it none the less touches upon the dogmatic nature of the Pope's world-wide jurisdictional authority. The idea that a movement can hold the credibility it needs before God requires that some very real obedience be shown to the Pope. Stated in terms of a "Pascal's Wager," it would be far more of a better bet to be obedient to the Pope than to not be. All the devotions in the world wont compare to simple obedience to Rome. One reason why I have a very hard time attending SSPX masses is because TLM Missal asks that the Sacrifice be pleasing to God through being done in union with the Local Ordinary. Well, if the SSPX can ignore the Local Ordinary, then that Mass is objectively lacking a 'pleasing to God' component to it. This leads to my final point: the true Traditionals are those like you and I who realize that the true suffering for what is right can only happen within the bounds of obedience to Rome. THAT's a real Cross to bear. I don't think anyone could say the SSPX is carrying a cross in that regard when they're not suffering at all, but rather having it their own way 24/7. They are very sad at the Modernism spread throughout the Church, but they technically are not suffering as we are. The SSPX has jumped ship in a way, while we remain on board hoping to wait out the storm. My heart truly does go out to the SSPX, as they have a lot right, much more than the majority of Bishops, but the Facts are what can make the difference between heaven and hell. Boniface. I am sure you are familiar with st. Thomas' reasoning on obedience and disobedience. The question bothers me. Are there any historical examples of ecclesiastical policy that required disobedience? How is this related to the promulgation of Novus Ordo? In relation to what in this modern days of Church should we act in just disobedience? How should this disobedience look like? Should the SSPX acted in disobedience but in some other form of disobedience? Is there any difference between schism and excommunication? Can schism be healed just by lifting of excommunications(it seems so when considered what are effects of excommunication which are given in CIC)? I cannot think of ecclesiastical property that requires disobedience, but I do not think the institution of the Novus Ordo required disobedience either. What should the SSPX have done? They should have not consecrated four bishops illicitly. The question about schism is interesting, because according to everything I have ever consulted, schism automatically brings about excommunication - the question becomes whether or not the revocation of the excommunications undoes the schism, which I had failed to take into account in my original post. If they are not in schism anymore, on the other hand, then I am unsure what the purpose of the talks are since they would be already in good standing with the Church. Woops, that should say "ecclesiastical policy", not "Ecclesiastical property." The Fathers say that schism goes along with heresy. Here we see the seeds of heresy - the assumption that the Church can promulgate rites and rituals that are positively harmful, which would be heretical. This seems to be the assumption behind the SSPX argument that Lefebvre was justified in making the consecrations. The Novus Ordo might have been inferior to the EF, but it is not positively harmful in and of itself, and as such, there can be no justification for disobedience to the pope based upon it. Perhaps you've read the article below? As for the SSPX. I think they are still intimately bound with the traditionalist movement, not to negate that the whole is greater than their part, but that their part is a prominent voice. Even though things are getting better, let's face it, these diocesan groups are not very strong and vocal at the points you make. They are on their level, but not as a voice reaching the Vatican. While I think the SSPX's views are too strict in the outright rejection of VII and the NO as "licit", I think they do bring to the table much of the criticisms which are mysteriously silent from many of these other congregations. No one needs to harp on the issues, but the tone is different. One is about preferences, another about principles. Also keep in mind that these parishes are still schizo. One Mass will be eucharistic ministers and the whole nine yards, and the other pure tradition. I don't understand why these priests don't celebrate the NO with as much reverence as they can squeeze out of the rubrics. So really many of them are still weak witnesses. We all need to pray for another. Also we can use the SSPX as a borometer to see how what the Vaticans tone is concerning (some) traditionalists. You also acknowledge that the Vatican has not been spot on all the time. I think the Vatican can be a little more open to (constructive and faithful) critiques of the last 50 years. It's a hard question. I've never gone to SSPX, but I always saw them as an option. I was confirmed by one of their bishops (pre-2007) and have always found them to be a mainstay of our time. If they went crazy, though, and rejected a perfectly good offer from the Vatican, I would no longer have this view of them. Pray! Do penance! About harmful practices...do you consider communion in the hand a positively harmful practice? If yes why, if not why not? What do you think of it generally and in terms of harmfulness? Well,the Novus Ordo does not call for communion in the hand; that was an abuse. I do believe communion in the hand tends towards abuse, but communion in the hand itself is not always positively harmful. It can be done reverently, as in the Early Church. So, no, communion in the hand is not a positive evil; it can tend towards abuse, and it is much less reverent than communion on the tongue, and it can be evil if done irreverently, but you cannot say it is a positive evil absolutely. But then again, communion in the hand is not a "rite of the Church" - it is a practice, and my original comment applied only to rites of the Church, meaning no authorized liturgy could be a positive evil. And, as I pointed out above, the Novus Ordo does not call for communion in the hand. I agree with what you've said about communion in the hand itself. I agree that this practice is distinct from the rite itself and it essential to it and that we are talking abour rites - liturgical rites which have a purpose of public worship of God. But i can't agree that the rubrics don't allow communion in the hand or that it is a an abuse in a legal sense. The rubric #160(USCCB version) allows either way - hand or tongue. But that's just for the U.S. The universal rubric #161 allows communion in the hand, where it is allowed, and it is allowed almost everywhere - so the rubrics don't see that practice as an abuse. Historically it got into the Novus Ordo because it was an abuse, and in the divine order of things it can maybe be considered an abuse, but legally it is not. I'm sorry, when I said "that was an abuse," I meant what you said, that it began as an abuse that was later legitimized. I know it is not considered an abuse now, but I meant it began as one. Even though GIRM allows for it now, the GIRM is not the same thing as the Missal itself, so I still think we can make a distinction between the rite of the Church and the other things that can go along with the rite. My understanding is that CDF has recently stated that, in the latter category, it is not wrong to state that some of these sorts of things (girl altar servers, for example) are objectively displeasing to God. Dear Boniface. Kudos. Yours is one of the best explanations I have ever read about what it means to be a Catholic Traditionalist. One crucial test of being a full-communion Catholic (routinely mocked by Mr Ferrara) is whether or not the individual or order will obey if the Pope takes a decision opposed to the will of the individual or order. If an individual or order does obey the Pope, he and the order are full communion Catholics whereas the individual or order which does not obey the Pope if his decision is opposed to the will of the individual or order alerts the objective observer that the individual or order is only in partial communion with the Church. I know that many, lead into error by Mr Ferrara and "The Remnant," mock the idea of partial and full communion (Shrine of the Holy Whapping has posted quotes from Saint Augustine proving Mr Ferrara wrong) but such a reality does exist and can be found in the old catechisms. Finally, if the Pope formally does define the sspx as schismatic, their sacraments of Marriage and Penance then become valid; and they will exist like the "Orthodox" Church, not a Catholic Church which they clearly consider themselves to be. The sspx is a petit ecclesia and they have missed the time of their visitation with Our Holy Father. I agree that the Novus Ordo isn't intrinsically harmful to the faithful. However, because of substantial amounts of Catholic doctrine which have been intentionally watered down or neglected in the NO, over time the NO has allowed harm to inflict the Church. The NO, to use a somewhat limited analogy, is like a person eating junk food - it has some usefulness for maintaining human life, and it isn't directly poisonous. But, if junk food is all one consumes, sooner or later it will allow serious health issues to bring harm to the body. That is what the NO has allowed to happen in the Church. And wrt to the SSPX being in schism, what about Absp. Lefebvre's claims about following his conscience to disobey Pope John Paul II because of a state of emergency in the Church? Seems to me that schism must also require -in addition to a schismatic act - the embracing a belief which goes contrary to the doctrines of the Church. I've never heard anyone tout that the SSPX has ever embraced anything other than the traditional teachings of the Church. Looking forward to your response on both of my issues above. Marko, there have been past situations when disobedience has been necessary, though it might be more accurate to say obedience to the truth which is not always obedience to the hierarchy (though obviously it normally is). More examples could be added up, but those are a few I knew I could easily find links for. Nick, Your hypothetical battle between SSPX and another sect is interesting, but it seems to me that if you want to make that kind of claim you should get your terms straight. What is the point of affirming that the SSPX thinks they alone are the true church and would consider any other traditionalists group who disagrees with them on anything as outside of the church when they flatly deny this? Obviously their organization is not beyond reproach, but if you're going to criticize them you should do it intelligently. The specific situation you suggest does not even make sense, as SSPX themselves explain that Traditionalism is bigger than their organization, so that you can easily read comments and criticisms they have publicly made about independent priests, Summorum Pontificum, or anything else related to Traditionalism. Obviously they think they have the most sophisticated and consistent position on the subject, both in theory and in practice, but they obviously do not think they are the Church. You can't really help anything by pretending they claim something they do not claim. If another group breaks away (and it appears a Fr Pheiffer has recently done just that) I don't think SSPX will say they're outside the church anymore than they say you are outside the Church or the NO bishop is outside the Church. Further, the mere idea that another group would break away and make similar claims should not trouble them anymore than the claims of break away groups like the "Orthodox" should trouble the claims of the papacy. If the original claim is valid, no amount of break away groups can invalidate it. If all Catholic left the Church but the pope and two others that would still be the Catholic church. But if your claim about entirely hypothetical splintering in SSPX were true then these hypothetical splintering of the Church would disprove the claims of the papacy. But in reality no amount of splintering could really be proof that the claims of the SSPX to be part of the Church (not to be the Church) are false, anymore than many schisms and fracturing in the true Church can prove this about the papacy. As a matter of fact the Orthodox use that very argument as proof that the west was wrong, pointing to the fact that the protestant deformation began in the west rather than the east, so perhaps you should be more careful trying to examine the actual claims being made rather than to resort to ridiculour arguments that could be turned against any organization that has any tension for any reason ever. @ Boniface – thank you really for willing to observe my comment and write an extensive answer. Again, I must say that I don't agree with the mode the problem is being presented, and I shall put forward my reservations and opinions in commenting your quotes. I woudn't agree with that expression – if Traditionalism is only of affection and devotion, then there is no real distinction between it and other 'charisms' which developed after the Council (Neocathecumenal Way, Focolarine Movement etc.) and could easily be put in the same basket. But we know that it is more than that, and as I see that further in the text you have expressed a correct vision of the thing – that traditionalism consists primarily in theological difference towards post-Council situation (i. e. Thomism and Neoscholasticism vs. Neomodernism), so that this is cleared up. ,,Once we note the difference between the two issues, one juridical and one devotional, we can easily see that they do not have a direct correlation. Our devotion, affection or passion for a particular manner of practicing our Faith does not have any direct bearing on the legal question of any group's canonical status. However we feel about the SSPX, the position we take on their canonical status cannot and should not be influenced by our own passions on matters liturgical, theological, or whatever. When looking at whether or not the SSPX is in schism, I do not concern myself with how bad the Church was when they went into schism, nor whether or not they were right to seek to preserve the 1962 Missal, nor the particular virtues of Lefebvre or the vices of Bugnini, nor any of these sorts of considerations - I only consider whether the act of consecrating four bishops illicitly was a schismatic act, from a legal standpoint, in isolation from these other questions. I think that here we have the greatest problem, or (I don't want to be harsh) - a fallacy which ends up in missing a final point. Formalistic approach, far from being the only reasonable, actually is contrary to the mere nature of Canon Law and ecclesiastical jurisprudence. How could we possibly validly examine any canonical question without considering the material aspect? We are not dealing here with the Sharia Law; the primal aim of the ecclesiastical law is, based on a pure consideration of the spirit of Gospel and the newness of Christ's message, that of the good of soals and their salvation. Actually this formalistic approach could be seen also in the mentality of the Pharisees which was denounced by Our Lord. Now, regerding our central point, that of the SSPX – what I was trying to assert is that the Traditionalist movement is practically inconceavable without it, and that everey sincere Traditionalist should pay a tribute to Archbishop Lefebvre for preserving the TLM. Please note that immediately after the Council, up until the episcopal ordinations in 1988, as far as I know, there was no organised group which was directed towards preserving the Mass. There were individuals, there was an Indult Mass here and there (in most cases set up with restrictions and in an isolated position), but there was no single organised body (there was Una Voce and other lay organisations, but without priestly organisation it would be very difficult to obtain something more) which would be considered seriously by Rome regarding the demand of preserving the TLM. 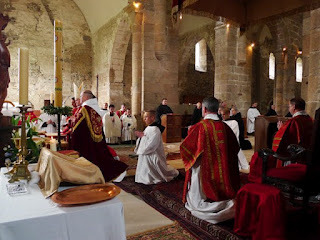 It is true that nowadays there are other Priestly Societies which are canonically recognised so that a faithful can go to them to receive Traditional Mass and Sacraments, but all this would be hardly realized without the preservation of the Mass which was conducted by the SSPX immediately after the Council and onwards. Now I don’t agree with the SSPX unreservedly, and I still never assisted at one of their Masses to be frank, but what I can see is that their position brings something uniquely to the Traditionalist Movement which could be, as I said, hardly conceivable without it. Just to present here a plain fact – a good part of the Traditional Catholic literature which I have read, goes to the SSPX sources. If you would try to search sources of the other Traditionalist societies, you could find scarcely anything. This priests are writing in some Traditionalist Catholic journals, but on their official sources you could find absolutely NOTHING. And this is a very serious issue, which tells us that the position of this canonically recognised societies is a bit limited. They just can not lead a serious official criticism of the post-Council novelties and in this sense, a critique which goes from the SSPX regarding their position must not be dismissed easily. If they would try to lead this criticism, they would most surely incur a sharp reaction from Rome, as it was in the 2000 in the FSSP when the ED comission imposed to them leadership which was according to their tastes. And the other one – what would be their answer to the situation when the local Bishop impedes any attempt of starting a traditional apostolate? Here the bishop is obviously abusing his power, and which should be our reaction? Should we just calmly stand by and get reconciled with this situation? Or if is there a right for everyone to worship God according to the laws of his rite, isn’t this an extraordinary situation where this right could be justly obtained outside of the diocesan structure? So if we try to think of a situation where the Pope would want to suppress the ancient rite of the Church and to impose on the same faithful a complete novelty which is not an adequate expression of the teaching of the Church, then there it would be a right to resist. And if this would happen to last very long and there would be a danger of having no more bishops to ordain priests to preserve this ancient rite, this would really be a case of necessity where the few last remaining bishops could justly ordain another ones, even without or against the Pope’s will. Again, I’m not saying that this actually did happen in the case of ++Lefebvre and the SSPX, but just trying to prove the mere possibility and the fallacy of the formalistic approach. On formal vs. material: I agree with you that you cannot judge the whole thing on the formal alone and that the material element in any legal case ought to be considered. In this case, the material point was considered when JPII evaluated the "state of emergency" argument and declared there was no such state of emergency. Therefore, the material element did not mitigate the formal disobedience. On owing SSPX gratitude: I agree, insofar as we are referring to their efforts at keeping the EF Mass alive. But we should distinguish between their efforts keeping the Mass alive and their illicit consecrations. The consecrations were in no way necessary to keep the old Mass alive. They did a valuable service for a time and they deserve our respect for that, but NOW they are not doing anybody a service and they are missing the hour of their visitation. Anyone is who providing a service one day may easily switch to doing a disservice the next, and this is the case with the SSPX. The Traditionalist cause may have been bound up with the SSPX in the beginning, but it isn't now. For example, a bunch of my former students are now starting their freshman year of college. They have been serving and attending the EF Mass since 2007 and have, to a large degree, had their spirituality nourished by it. But they have never been to an SSPX Mass; most of them don't even know what the SSPX is, but they are Traditional in every other sense of the word. The SSPX doesn't mean anything anymore, and they won't mean anything unless they reconcile. Refering to Boniface's comment and extracting from it i drew conclusion that the main issue is whether or not those consecrations were absolutely necessary for the traditionalist movement and preservation of the TLM. It was offered to him to consecrate one bishop, and although the date was delayed on several occasions he could have waited 3 more years(when he died) and could have consecrated many many more priests. I don't think Rome would be delaying the consecration for so long. So in my opinion, it was not absolutely necessary for preservation of Tradition to consecrate those bishops. Boniface - thank you again for your comments, I'll take time to examine them later. For now I just wanted to ask, why do you constantly keep using the 'EF' term? Doesn't it seem that it has a notion of limitation towards the New Mass, putting it in a somewhat inferior, secondary position? Benedict XVI himself uses the terms Extraordinary Form and Ordinary Form, so therefore I use them as well. Hopefully, the Extraordinary Form becomes as common as Extraordinary Ministers! Many of the statements the SSPX has been putting out certainly is giving off the impression that Rome is fully submerged in Modernism while the SSPX giving off the impression they are the ones carrying the torch. This isn't so much true when I read the words of Bp Fellay (since he is pretty level-headed), but when other members of the SSPX issue statements they often make some pretty sharp us/Rome distinctions. For example, a recent occurrence I have in mind the latest (Sept 6,8) letter from the SSPX-Asia district. Excellent comment. I have prayed and still pray that the SSPX will be reconciled with the Church, but if not the traditional Mass will continue to flourish with the Church without them. For the Society of St.Pius X Vatican Council II and the Catechism of the Catholic Church is a rupture with the past. This is because they use the false premise. Vatican Council II and the Catechism of the Catholic Church without the false premise of being able to see the dead saved, is traditional.It is rational,with the hermeneutic of continuity.It is not a break with the past. It does not contradict the dogma extra ecclesiam nulla salus and the Syllabus of Errors. Vatican Council II and the Catechism of the Catholic Church agrees with Tradition.The SSPX websites still do not address this issue, for or against. Neither do the SSPX leaders comment on it. I haven't gone through all the comments here but based on my limited understanding I think the SSPX is correct. From what i gather, in 1988 Cardinal Ratzinger told Lefebvre that they must say the NO if the local bishop wants it - for Lefebvre this was unacceptable given the NO as we know it pretty much destroys the faith and leads to sacrilege. There is youtube footage of Lefebvre in the mid 70's going to Rome to talk about some problems they were having and that many faithful didn't want "the Lutheran Mass". Given the NO is a basket case I agree with him on point 1. Amongst other things given the sheer confusion post 1965 and Cardinal Kasper's recent comments on the deliberate ambiguities implanted in the VII documents I find it hard to disagree with him on that. Previous Councils' documents were black and white, VII has some shades of grey, the Devil's favorite color. The Church is in a state of emergency and this is confirmed by all statistical indicators. Concur with above reader who says Fellay is a level headed guy having seen him speak at the invitation of friends who introduced me to the TLM that saved me from becoming a Jew for Jesus or something like that (I am not an official SSPX'r btw). Interestingly Fellay gave good evidence that Masons are still in the Vatican at a very high level. There are some nutty elements of the SSPX and some of their members have a radical almost Feenyite interpretation of EENS which is in complete contradiction to Lefebvre himself and sometimes with these extreme types it seems there is a form of spiritual snobbery at play. I even met one couple who said there is no salvation outside a Traditional Latin Mass community. But overall I agree with their premise that there has been a rupture in theology caused by ambiguities in the Council documents, the NO is catastrophic on Catholic belief and that there is a state of emergency. Also not part of the argument here but I agree with the sentiments of Cardinal Oddi whom upon visting Lefebvre's tomb said he was a "holy man". Am happy to be corrected if I have gotten some detail wrong in the above. You are right on the basic facts, although I disagree that the NO itself is destructive of faith, as the Church can never legally promulgate a liturgical rite that is positively offensive to God. Still, to me, none of this matters. It does not matter to me how bad things are, how many Masons there are, how bad things get, how much good you have done, how valiantly you have defended the Church's Tradition, how right you are in your critiques - the second you disobey the Holy Father and put yourself outside the Church's jurisdiction, you go bad, all your merit becomes demerit, any good you may have done is sullied, and you are not worthy of sympathy. I do not sympathize with the SSPX. "You are right on the basic facts, although I disagree that the NO itself is destructive of faith, as the Church can never legally promulgate a liturgical rite that is positively offensive to God." Why? The NO wasn't declared with an ex cathedra type infallibility from what I understand. I would like to understand this a bit more if you have time to comment Boniface. Many including Bishop Sheen have said before God chastises the world he first chastises the Church, this is what I think the NO fits under. Michael Davies wrote that Cranmer originally did the NO type gestures to destroy the Catholic faith in England. There is a rich theology behind the TLM and its gestures, the destruction of which has caused all sort of problem and seen in large part imo the great falling away something B16 himself commented upon. I think many people realise there is something intrinsically wrong with it and stay away - I have taken people of all walks of life to both NO and TLM, every reaction to the NO has been "this is odd" and they seem confused; the latter they don't completely understand but there is something ancient and sacred there (note I am not saying the NO is invalid). If the TLM was offered widely many would return to the faith over time. My main issue with the NO is its celebration facing the people and attention being diverted from God but there are so many other problems. With Fellay I think he had the right recently to resist being silent about the NO and the problems of Vatican II. I agree on your comments re the Masons and evil in the Vatican and my purpose of that was merely to inform that they are still there not as an argument pro SSPX. It's been awhile since I read up on it, so I can't answer you with a specific citation, but basically since the Church's public liturgical rites are so integrally linked with her identity and the worship offered God, she cannot promulgate any rite that is in and of itself offensive to God, blasphemous, heretical, etc. It is similar to the reasons why canonizations are considered infallible - if they were not, the Church could be encouraging the Faithful to offer prayers to people who were not really be in heaven at all, which would in fact constitute the Church "teaching" error (see here: http://unamsanctamcatholicam.blogspot.com/2009/09/infallibility-of-canonizations.html)- similarly, the Church's liturgy is pedagogical, and she cannot maintain her freedom from error if she is publicly promulgating liturgical rites that are offensive to God in and of themselves. This is not to say all are equal or one cannot have more merit than another...but the NO, as a licitly promulgated rite, cannot be intrinsically offensive to God. And liturgical rites are not promulgated by means of ex cathedra pronouncements anyway. The Missal of Pius V was not promulgated ex cathedra either. Today morning I attended the Tridentine Latin Rite Mass and I thought to myself that there is an attraction to this Mass since it still holds the 'old values' the Original Catholic Faith which never changes. Then I thought to myself that if the misunderstanding of the Richarc Cushing Error was clear then even the priests who offer the Mass in the vernacular would be affirming the tradional faith, with the same values on other religions and Christian communities. The SSPX's interpretation of Archbishop Lefebvre and Vatican Council II has been irrational and the same irrationality is being used by the priests who offer Mass in the vernacular languages. Bishop Bernard Fellay and the SSPX 's interpretation of Archbishop Lefebvre has been irrational over the years. I have met SSPXr's who have denied baptism of desire which I also believe Fr Feeney did. Hence the statement and nothing to do with the Cardinal Cushing error. In fact I have met some SSPXr's who think there is no salvation outside a trad chapel and look forward to everyone ending up in Hell, they have their own takes on EENS which is in contradiction to Lefebvre. I can only speak for myself Jamey. If Fr.Leonard Feeney meant there is no visible to us baptism of desire then he was correct. I too believe there is no visible to us baptism of desire. I accept implicit baptism of desire. It is explicit only for God. The Cushing Error was assuming there was a visible to us baptism of desire. So Cardinal Cushing was critical of Fr.Leonard Feeney who said that there were no exceptions to the literal interpretation of the dogma. Also the baptism of desire was not an exception. Catholic Mission it seemed at one stage Fr Feeney didn't deny baptism of desire but as war continued with Cushing some say he became more extreme to the point where he did. Can "Baptism of Desire" save you? Could "Baptism of Desire" save you if you really believed it could? Could it possibly suffice for you to pass into a state of justification? If you got into the state of justification with the aid of "Baptism of Desire," and then failed to receive Baptism of Water, could you be saved? It seems quite obvious that we will not know those who are saved by baptism of desire its unfortunate that it has to be mentioned. In another part of the book, possibly in the same chapter, he says, "I don't know ". Since if you do not know of a particular case, how can you judge ? None of us knows!Since we don't know any such case. If he says "baptism of desire can never save anyone" then that is heresy, since Trent plainly teaches that it can. The problem, I think, is that many view baptism of desire as some other form of salvation outside of baptism - when in fact, it is simply the grace of baptism applied without the sacramental sign of water. It is the same grace - it is still baptism, just without the sacramental sign. So baptism of desire can save simply because it is baptism. But, to affirm what Catholic Mission has been saying, to the degree that this happens, and to whom it happens, no one can say. There are a few saints (Emeretiana, for example), whom the Roman Martyrologies specifically say were saved without water baptism - presumably by desire. But beyond that we can say nothing, so if we start presuming that pagans or anyone of "good will" is saved by this, we certainly stray into error. There is no visible way to tell who has been saved by this, apart from the example of the Roman Martyrology mentioned above. (Emeretiana, for example), whom the Roman Martyrologies specifically say were saved without water baptism - presumably by desire. The point I was trying to make was that even Emeretiana, would not be an exception to the literal interpretation of the dogma. In the present times, as Boniface agrees, there are no known exceptions. The ordinary means of salvation for pagans and others is Catholic Faith and the baptism of water(AG 7,CCC 846). It is not the baptism of desire. Right. We are only viewing baptism of desire rightly if we see it as a kind of extraordinary extension of normal baptism in circumstances (known to God alone) when performance of the sacramental sign is not possible. It is not "another way" to salvation outside of baptism - it simply is baptism without the material sign. I have not read through all of these comments, but I was wondering if you heard the argument that Archbishop Lefebvre was not actually excommunicated because he had an honest belief there was a dire emergency concerning the continuation of the Latin episcopate. I forgot the canon number, but I remember reading a canon that said basically if a bishop honestly believes there is dire emergency, even if he is wrong, that he can consecrate bishops without incurring excommunication. The emergency that Lefebvre believed he was avoiding was the loss of hierarchy due to the adoption of the 1970 consecration rite (I recall hearing that even non-Traditionalist priests and theologians were unsure of there validity for a time). I remember that Lefebvre did not really fully accept the consecration (not ordination) rite till later. The problem is that even if Lefebvre was not actually excommunicated, there is still the issue that one cannot simply contest a papal excommunication by saying the pope is wrong. I recall reading one of the Papal Bulls written in response to Jansenism (I think on this website) that listed a list of Jansenist positions and doctrines. One of them stated was that it is okay to publicly contest a papal excommunication was at best "smacking of heresy" if not an actual heresy (I recall it listed a list of Jansenist positions and said at the end that they were a. heresy, b. smacking of heresy, or c. a third thing I forgot without specifying. I may have recalled it incorrectly). Basically, Lefebvre could not really publicly challenge his excommunication, even if (which makes it really awkward for a priest or layman to work with Lefebvre). I remember reading a transcript of an interview Lefebvre did. I recall thinking it was strange that the Archbishop said the phrase "after the excommunications," which I thought was odd because I thought the SSPX, and I assumed Lefebvre himself, were of the position that they were never in fact excommunicated. Maybe he said that phrase . I don't remember if Lefebvre himself ever directly and publicly stated he was not excommunicated. If he did not, then that papal bull may be why. I don't go to SSPX masses. I thought about going to one 2 years ago, but it was too far away and I was still unsure of their position (hearing contrary things) so I do not really have a stake in defending them. However, I admit that my time researching sedevacantist/sedeprivationist/sedeimpedist groups in my spare time has made me see the SSPX as basically moderate and not crazy (with the exception of the "resistance SSPX" and some SSPX in the Kansas area Michael E Jones wrote about). Even if Lefebvre believed the excommunication was unjust, he was still bound to observe it externally. Firstly, thank you for responding to my comment. I wasn't sure if I would get a response since the thread was four years old. I'll see if I can get the book over the summer (if I don't have enough time then I'll at least go to their website). I heard of some of SSPX's justifications for the consecrations and I also did not buy any of them. The only one that seemed kinda plausible was the issue concerning the loss of orders. The problem with this is that the Vatican was willing to send a priest to be made a bishop by Lefebvre (I suppose that the SSPX counter argument is that Lefebvre had guarantee that the Vatican would send someone who would be willing to continue using the old rites of consecration and ordination after being made a bishop). However, even if Lefebvre truly believed there was an emergency then he would have had to basically go with his new bishops to a monastery like Athanasius did (thank you for sending that link). After realizing this, it finally clicked why the SSPX argued/still argue the amorphous "emergency" of a general loss of tradition, and why they made some more extreme claims (for example that the old translation "for all" in English made the consecration of the wine and therefore the mass invalid). This would be the only way they could justify serving as priests despite the a divinis suspension. I read over the Jansenist controversy over the weekend and it seemed that the SSPX's argument is eerily reminiscent of the Jansenist question of fact issue. My last question is why Lefebvre or other tradionalists did not say the Pauline mass in Latin ad orientem as some priests do today? Its relatively well known that he did the 1965 mass. I know that they are still different textually, but many of Lefebvre's issues with the new/Pauline mass were based on translation issues that arose. I ask this because there was a recent report going around that Fellay said that Lefebvre might have been open to saying the Pauline mass this way. Thank you again for responding. I appreciate it. That I really do not know the answer to.